Android Studio 1.3's stage is closed to the stable release. New features are keep coming including full NDK support. And it seems like some major change is also being waited for its good time to hatch such as a new Gradle Build Tools with the newly designed DSL (gradle script code structure). I found it is very interesting after an hour of playing. So I decide to write this blog to introduce you guys the upcoming changes of the build tools to let you prepare. 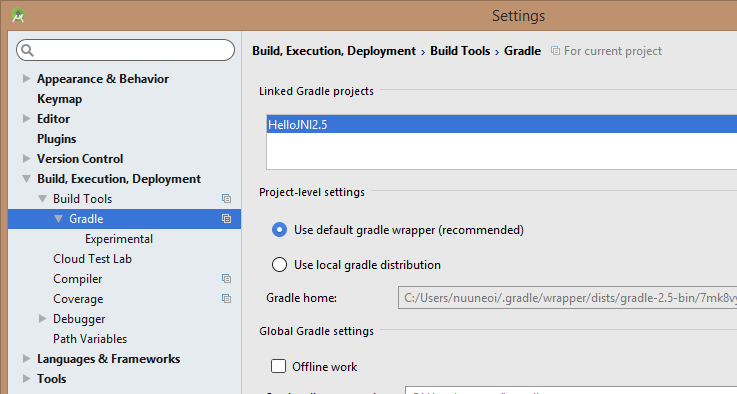 What is Android Gradle Build Tools? In case you don't know yet. Android Gradle Build Tools is a runtime used for processing module's build.gradle file before passing it forward to Gradle for the furthur step. Each version of Gradle Build Tools can work with the supported Gradle version listed below. And the syntax we use these days to write Gradle Script in build.gradle file is defined in Android Gradle Build Tools. We call it DSL (Domain-Specific Language). After DSL hasn't been touched since the launch of Gradle Build Tools 1.0, Android Studio team has decided to do the major change with the new Gradle Build Tools which is still in the experimental stage by change its base to Gradle's new component model mechanism allows significant reduction in configuration time. However development teams are working hard trying to remove these current changes to minimize the migration process from the traditional plugin in the future. Anyway IMHO the new DSL looks pretty good. I must say that I am convinced to change since the new DSL structure and naming is more meaningful than it currently is. Please note that this new version of build tools works with just-released Gradle 2.5 only so you need to install it first by modify distributionUrl line in gradle/gradle-wrapper.properties file placed in your project. Enter settings page (File -> Settings on Windows or Android Studio -> Preferences on Mac OS X) and make sure that you check Use default gradle wrapper. Well, let's sync project with gradle files to apply the change. And then simply run it. Everything works fine as expected with the more meaningful syntax, built with new-fresh Gradle 2.5. Android Studio 1.3 was proudly announced with full NDK Support. So let's give a try with some very simple native codes. First of all, you need to define a NDK's directiory to project's local.properties file. Please note that you can use both NDK r10e available in Android NDK Downloads Page and NDK Bundle available in SDK Manager. 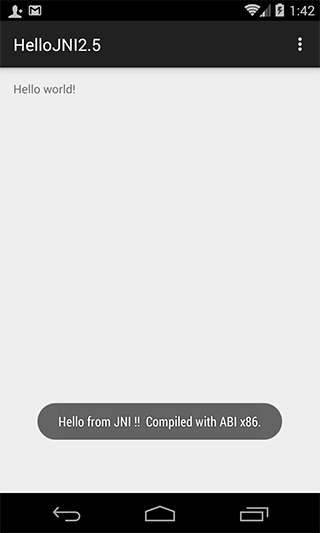 Create HelloJni.java somewhere in your java package. Make a jni folder inside src/main and create hello-jni.c file with the content shown below. Please don't forget to change com_inthecheesefactory_hellojni25 to match HelloJni.java's package name or it will just simply not working. For those who are familiar with NDK, you might notice that Makefiles aren't needed anymore. And here is the final file structure. 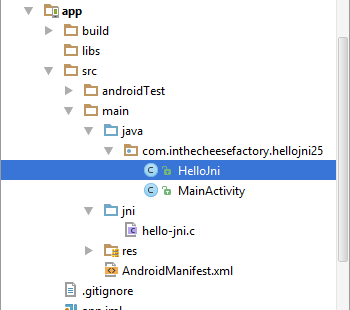 Now let's test the JNI code in MainActivity.java by placing code below at the very last line of MainActivity class. Done! You can now use the native code through Java code. Run to try it. And with the awesome full support of NDK on Android Studio, Java code and Native code can now work seemlessly. If you inspect code in Java, it will jump you to the right place in native code. Anyway it is still in the experimental stage. Some features are still under development. Better wait for the final release for serious use. I must say that the new Gradle Build Tools is very interesting. Major change to DSL looks really promising and far more meaningful than the current one. The great code should be able to tell what it does, agree? However it is still in the experimental stage. The DSL is not final yet. We better just study and know its existence rather than switching to the new one right now. Anyway I believe that it would not be so long until the stable release available for real use. Be prepared !